Originally the sheep farmed were Lincoln and Merinos. There were major health problems with these two breeds and Romney were introduced in 1892. The Kikitangeo Romney Stud was established in 1922 by the present owner's father and uncle. In 2010 Kikitangeo was the 11th oldest registered Romney Stud in New Zealand. The stud was bred on conventional lines until 1951 when the present owner took over a management role. It was immediately noticed that the daughters of some sires performed much better than others, for instance the daughters of one sire had a lambing percentage of 60% while another sires daughters had a lambing percentage of 140%. A card index system was set up at this stage with each ewe having her own card recording a number of production traits. This information was then converted into an index system. All this happened 15 years prior to the introduction of the National Recording Scheme in 1967-The forerunner of ‘Sheeplan’, Animalplan and Sheep Improvement Ltd (SIL). Up until the mid 1960s animals were judged solely by eye appeal and ‘handle’ with any recording frowned upon. In 1972 a top KIKI ewe was taken to Ruakura for embryo transfer work. Subsequently in 1973-1974 our local vets were used to continue the programme. The objective was to get more lambs from our top ewes. Kikitangeo was the first flock in NZ to use this technique. In 1986 we entered a programme to breed for facial eczema (FE) tolerance which has been an ongoing process. A visit was made to Ruakara in 1987 to discuss the heritability of breeding for internal parasite (worm) resistance. There we met with Dr Tom Watson a colourful Canadian parasitologist who designed a protocol to achieve this purpose. These same protocols are used today in the national scheme known as the ‘Worm FEC’ programme. 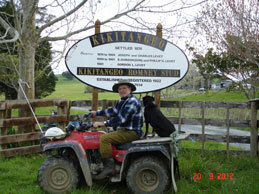 Kikitangeo was the first stud in NZ to try to breed for worm resistant sheep. In 1989 it was decided to sell rams by public auction.